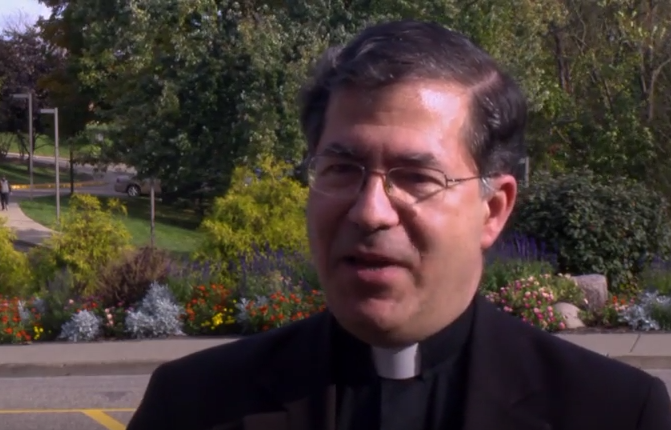 Father Frank Pavone, who heads the group Priests for Life, has been hard at work in radio interviews and event appearances trying to convince Catholic voters to overcome their qualms and support Donald Trump in the presidential election simply because he opposes abortion rights while Hillary Clinton supports them. This has led Pavone to make some interesting leaps of logic, such as telling one radio caller who worried about Trump’s decidedly un-Catholic stances on issues like nuclear war and war crimes that a possible nuclear war under Trump was less of a concern than the definite continuation of legal abortion under Clinton. It was such a disservice to the Church. I mean, he represents a brand of thinking, we find it in the Church, we even find it among some clergy, you know, talk about social justice but ignore the core of social justice, which is the right to life. You cannot be right on these other issues, whether it’s poverty, immigration, war and peace, homelessness, health care—let me make a very clear statement here: Not only is abortion a more important and weighty issue than all these other issues and not only is it more important that someone be right on abortion than they be right on these other issues, but I will say it this way, you cannot be right on these other issues if you are wrong on abortion. And the reason is, to allow abortion is to allow an attack on what is the core, the heart, the foundation of all these other issues, this is the right to life. If I say a baby’s life can be taken, well then I’ve just said his health care can be taken and so can his education and his right to vote and his right to immigrate and his right to anything else, to be protected from terrorism. What does it mean to say the baby should be protected from terrorism if I can get the abortionist to go in there with forceps and chop his head off? I don’t understand. This is basic logic and the people like Tim Kaine who present themselves to us to lead this nation, not only are they contradicting Catholic faith, they’re contradiction reason and they’re contradiction the purpose of public service, which is to serve the public, not to kill the public.